Clogged and overflowing gutters can cause damage to your roof and foundation and cause leaks in your attic, basement or crawl space. Home Solutions Midwest can help you avoid expensive repairs by installing the Gutter Helmet® gutter guard system. This patented, warrantied gutter protection system prevents gutter clogs and ice dams. With Gutter Helmet installed, you can say goodbye to climbing ladders or paying someone to clean your gutters. If you're interested in Gutter Helmet gutter guards for your home, call us today at 1-844-665-0388 or click below to schedule your no-obligation consultation. We offer free cost estimates on all installations in Rochester, Northfield, Mason City and surrounding areas in Minnesota and Iowa. Gutter Helmet® is a patented gutter topper, designed to allow water into your gutters while blocking the leaves, twigs, and debris that clog gutters and cause them to overflow. The Gutter Helmet® system consists of a textured gutter cap with a curved design at the edge. Water flows over the top of the cover, where the textured surface increases surface tension and causes water to cling to the cover and curve down into the gutter. The space between the cover and the gutter is too small for debris to enter, so it simply falls right off the edge as water pushes it along. When you decide to install Gutter Helmet from Home Solutions Midwest, you can rest assured that you will enjoy the best possible customer service. We've been a certified installer of Gutter Helmet since 1991. Our on-site crew gets the job done quickly, efficiently and with a smile. Quality customer service and workmanship is our first priority. 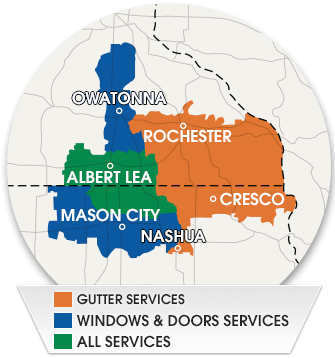 If you’re wondering whether Gutter Helmet is the right choice for you, we offer free in-home consultations and estimates in Winona, Owatonna, Austin, Faribault, Farmington, Northfield, Albert Lea, Northfield, Rochester, Mason City and nearby Minnesota and Iowa. Give us a call today to schedule yours!